Battered by his experience as prime suspect in the murder of his not-quite-ex wife, Eli Landon retreats to Bluff House, the historic house in Whiskey Beach that has been the home of the Landon family for three centuries. Although insufficient evidence meant that Eli was never arrested, his position as a “person of interest” and the media frenzy surrounding the police investigation have destroyed life as he knew it. His career as a criminal defense lawyer and rising star in a prestigious Boston firm is over, and most of his friends, convinced of his guilt, have abandoned him. His parents, his sister and brother-in-law, and his paternal grandmother have never wavered in their belief in him, but his concern over the effects of the investigation on his family adds to his burden. When his grandmother is injured in a fall and needs to be in Boston for physical therapy, Bluff House is empty. It offers space and privacy and is a perfect refuge for Eli to work on the legal thriller he is writing and to discover who Eli Landon has become after the emotional storms of the past year. Abra Walsh is a yoga instructor, part-time housekeeper, and close friend of Hester Landon, Eli’s grandmother. It was she who found Hester after her fall. Already persuaded of Eli’s innocence by what she knows of the case, Abra responds to the sadness in Eli from their first meeting. She has survived an experience that left her a different person and understands Eli on a level that few can. She is also a nurturer by nature, and she proves herself as adept at taking care of Eli as she is at taking care of Bluff House. She prepares food and encourages Eli to eat and pushes him to exercise. She uses her skills as a licensed massage therapist to help him relax, and she persuades him to end his isolation from those outside his family circle. Abra’s ministrations combine with the memories Bluff House holds and the wonders of the New England coast to end Eli’s apathy and restore the assertiveness that once characterized him. Eli is uninterested in reclaiming his former life, but he recognizes that he will never be truly free until his wife’s murderer is found. When Abra is attacked at Bluff House and a P. I. who has followed Eli to Whiskey Beach is killed, Eli and Abra begin to suspect that Hester’s injuries may not have been the result of an accident and that the invasions at Bluff House may be linked not only to the legendary pirate treasure that is supposed to be hidden there but also to the murder of Lindsey Landon. Eli and Abra trust one another enough to join forces as sleuths, but can they trust one another enough to surrender their hearts as well? Nora Roberts once again demonstrates that romantic suspense can be as much character-driven as plot-driven and that romance can remain the heart of the story without sacrificing suspense. Whiskey Beach is essentially Eli’s story. He is the broken character who must find a way to build a new identity and a new life from the pieces that remain. The free-spirited Abra who nurtures him, challenges him, and flirts with him is just the person he needs to bring light and laughter back into his life. She’s also strong enough in her sense of self to meet him on equal ground when he regains his confidence. I liked both these characters, and a full cast of secondary characters that includes Eli’s family (particularly his grandmother), Abra’s yoga students, and a motley collection of detectives enrich the story. The villains are the kind of plausibly evil characters that Roberts can do well. Two things I always expect in a Nora Roberts romantic suspense novel is a powerful evocation of particular place and a sense that the hero and heroine are actually engaged in their jobs. Roberts certainly fulfilled both those expectations in this book. Bluff House, the beach below it, and the Whiskey Beach community all have a convincing presence in the story. I thoroughly enjoyed the details about Eli’s writing process, and even though I found Abra’s list of jobs a stretch, I could visualize her as yoga instructor, massage therapist, and housekeeper. I rank this one a star below last year’s The Witness, recently released in paperback, but it is a solid read that leaves the reader satisfied with both the romance and the mystery. 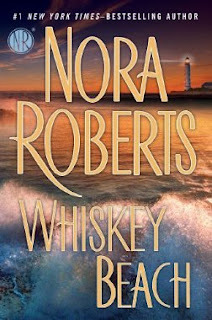 Fans of Nora Roberts will not want to miss Whiskey Beach, and romantic suspense readers who prefer their RS reads to provide suspense without straying into thriller territory should also enjoy it. Sounds like another winner from NR, I haven't even read The Witness yet, I am way, way behind. Diana, I thought The Witness was among her very best romantic suspense novels plus it's her 200th book. I also liked Whiskey Beach, but it's only available in hardcover now--or in digital format. The latter is still $15. If I had not had a review copy, I'd probably have waited for the pb next spring. Am putting this one on my wish list. Havent read Nora in awhile. Did read Witness many years ago and all of her older romances. Glad you enjoyed the review,Pat. The Witness was first released in hardcover in April 2012. The paperback edition was released early this month. With 200 plus Nora Roberts books around, it's hard to keep all those titles straight, isn't it? I recommend both books. Thanks for the great review. I love Nora Roberts and have read every one of her books. Whiskey Beach is on my TBR list so I this review just makes me want to read it more. Thanks, Marilyn. I agree with you about Nora Roberts. I've been reading her books since 1985 and rereading many of them as well. Dang it, Janga! Everytime I come over here to see what you guys are up to, I end up adding to my TBR list!! Hmmm, mother's day is coming, perhaps I'll just add this to my Mom's present. She adores La Nora's books!! This one is on my TBR list. Thanks for the review. I am definitely putting it on my wish list. I love suspense and romance combined. And she does it great. Can you believe I just read my first Nora this year!! I've read 3 now and enjoyed them. Thanks for the review! I'm reading this book now and agree with the review. 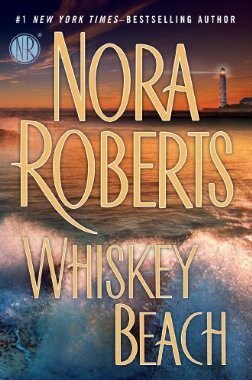 The Witness and Whiskey Beach are in the upper tier of all Nora's books. While I'm enjoying Whiskey Beach, I concur with you that the number of jobs that Abra works is a little far-fetched. I can understand her wanting to do something she likes, but no one likes working 5+ jobs. Also, with the amount of money Eli's family has, it would be more realistic to hire security guards, rather than relying solely on a security system to keep out intruders. gonna be a 'keeper' can't wait to read it. I will definitely read Whiskey Beach. I seem to be in the minority because there were many things about The Witness that I didn't like. However, I am a huge NR fan, and this one sounds right up my alley. I like the sound of this one, Janga. Thank you! I generally read romances, but not romantic suspense books. I like the description of this book & have never disliked a Nora Roberts book, so I will give this a try. Thanks for the thorough review! I hate to admit it, but I have not yet read anything by Nora Roberts! I did receive an ARC of "The Witness" a few months ago so I think I'll start with that. Thank you for another wonderful review, Janga. NR is one of my fave author and one of the few i keep buying. Can't wait to read whiskey beach!